The Super Bowl is over and conference races are starting to shape up. 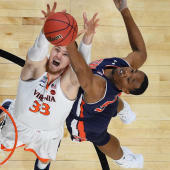 Though there are still a handful of weeks left in the regular season, the time is now for teams to start making a move toward that 68-team NCAA Tournament field, especially if they are teetering on the edge of relevancy this season. In this space, we aim to break down the teams rising (or falling) toward that goal. Few teams are benefitting from the change from the RPI to the NET more than NC State. The Wolf Pack would be 118th in the RPI, but is 35th in the NET. That is because they are a top 25 team in net efficiency. NC State played the second worst nonconference schedule in all of Division I. Bubble teams get left out for poor nonconference schedules almost every year. The Wolf Pack has home wins over Auburn and Clemson, but only one bad loss. This is a team that needs quality wins and has a few chances left to get them. Ask anyone about the Hoosiers tournament chances and people will say "they're done". That's not quite true. It is more accurate to say "if they keep playing the way they are, they're done." Fortunately, Indiana's remaining schedule gives it chances for quality wins. Quality or otherwise, the Hoosiers need to get back to playing the way they did during their 12-2 start and just start winning again. That team can still make the tournament and there is still time to do it. The Terriers played four potential tournament teams in nonconference play and came up short against all of them. The Southern Conference has given them chances to pick up Quad 1 and 2 wins though, and they did win at South Carolina. If Wofford needs an at-large bid, the lack of a win over a sure tournament team could be a problem. Right now, they have yet to lose to a team outside Quad 1. That may need to be true in the end as well.